Development Block Grant (CDBG) grant writer and has consulted in the areas of strategic planning and organizational development for non-profit boards. Josefina is a graduate of the Chicano/Chicana Studies program at CSU Northridge and of the Urban Planning graduate program at UCLA. Josefina enjoys amateur photography, sewing and traveling to experience new cultures and communities. Arrens had fifteen plus years of progressive experience handling all aspects of daily accounting operations, financial reporting, month end closing, internal controls, financial planning and analysis, ERP management with Big 4 audit, large advertising and public cpa firm serving small to mid-size retail, non-profit organizations, petroleum, construction and manufacturing clients before she joined TRUST South LA on 2012. 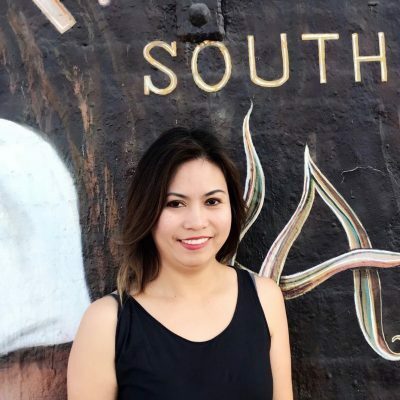 She is a graduate of Bachelor of Science major in Accountancy and a graduate of Master Executive MBA Program from Ateneo Regis University-Philippines. She is an active member of American Institute of Certified Public Accountant and California Certified Public Accountant. She is also a Certified Global Management Accountant and a Certified Tax Preparer. Oscar Monge is a native Angeleno that aspires to stabilize gentrifying neighborhoods through community building and community control. He joined T.R.U.S.T. South LA in 2017 as an Environmental Planner and has recently stepped into his new role as Community Development Manager to support T.R.U.S.T. South LA’s ongoing large scale and small multifamily housing projects. His interests include implementing equitable planning strategies, coalition building, and harnessing institutional strength to implement resident-led alternative socioeconomic systems. Oscar brings a broad range of experiences working with non-profit and public sector organizations focused on improving the quality of life of inner city residents. 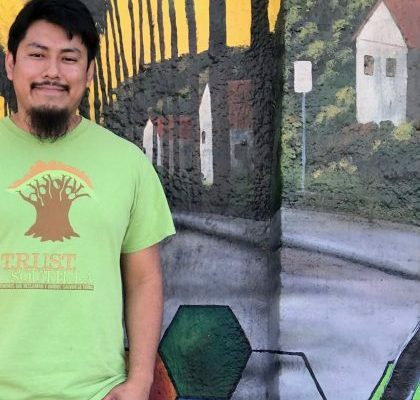 His passion for social and environmental justice started at an early age when he joined the LA Conservation Corps (LACC) and visualized how his own underserved community could be beautified with environmental work and youth economic empowerment. Inspired by these ideals, he returned to LACC and worked closely with LA’s inner-city youth to increase access to education and job training programs. 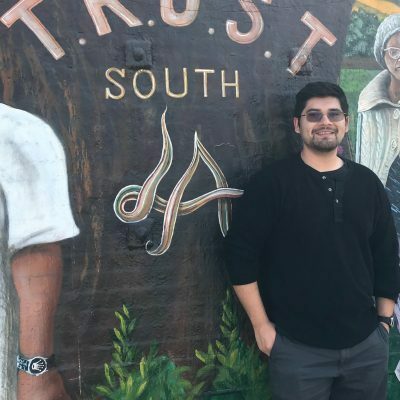 While completing his Master of Planning degree, Oscar worked with the USC Center for Urban Education analyzing Equity Plans for institutions of higher education and with the City of Los Angeles’ LA Promise Zone in their efforts to complete a comprehensive community needs assessment. Justin Manuel is a long-term resident of the community and a member of T.R.U.S.T. South LA. Growing up in South Los Angeles with his mother and his younger sister, Justin always noticed areas in which people needed assistance in his neighborhood, including his home, and decided it was time to do his part. Justin supports T.R.U.S.T.’s efforts to stabilize South LA neighborhoods by creating and preserving affordable housing for the people in his community and to assists his neighbors with biking and walking programs. Eager to contribute to his home community, Justin joined the organization on September 2016 through the Public Allies Program and recently became a full-time team member. He looks forward to continued implementation of mobility programs and advocacy work to improve street conditions, access to affordable housing, and fill South LA with positive energy and community-led change. 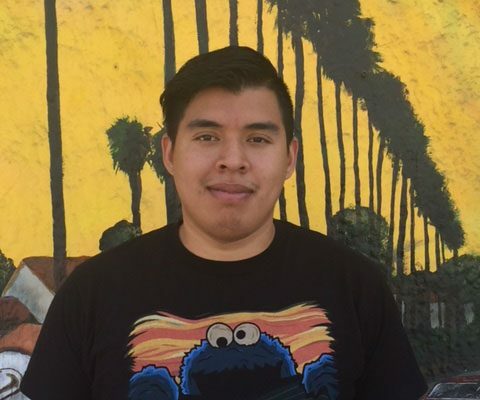 Emmanuel Beltran is an angelino originally from Montebello, CA who moved at the age of six to live with his father in South central Los Angeles. Working five years for an affordable housing and Active Transportation developer, Emmanuel has a diverse knowledge of community empowerment, coalition & membership building, and leadership development to implement ideas and manage environmental and active transportation programs. 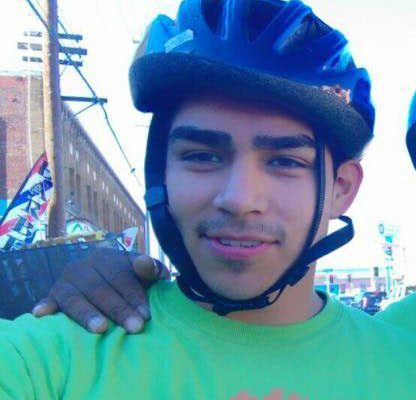 Since fall 2013, Emmanuel’s commitment to South Central LA was key to visioning and leading TRUST’s Walkers & Rider groups. 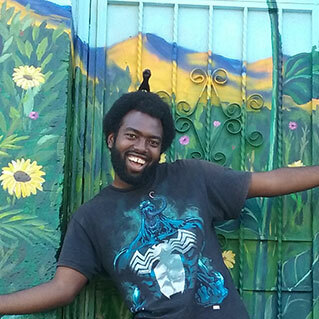 Emmanuel is an advocate for the issues close to the the hearts of people of South LA. He has personally witnessed the critical housing challenges families suffer with high rents and unsafe streets. Emmanuel is a strong believer and supporter of TRUST’s Community Land Trust vision to stabilize long-term residents through community control of their homes and neighborhoods. Emmanuel’s leadership drive and devotion to support families who face challenges in South LA started at an early age with his family and faith. While completing high school, Emmanuel was Key Club International president and led numerous volunteer events. He looks forward to continue leading efforts in community engagement & organizing, mentoring youth and working towards community controlled affordable housing and the Active Transportation programs. 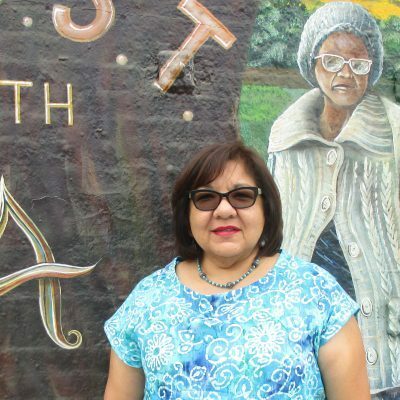 Gabriela Nunez was born and raised in South Los Angeles. She has been volunteering weekly at T.R.U.S.T. South LA since summer 2017. At T.R.U.S.T. 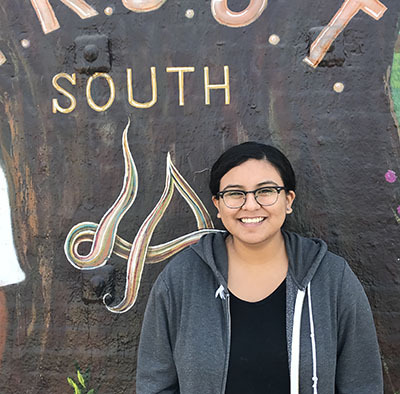 South LA, Gabriela has been involved in projects like the “Welcome to Our Neighborhood Dream” Slauson & Wall community event and their resident-led Sustainable and Stable Slauson plan. In addition, she has worked in T.R.U.S.T.’s office; organizing files, drafting and publishing bilingual social media posts, drafting letters, and assisting with many other clerical needs. 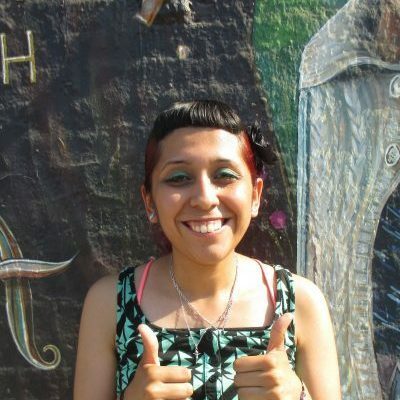 She is earning her Bachelor’s degree from California State University, Los Ángeles, majoring in Political Science and minoring in Chicana/o Latina/o Studies. Native to Mexico and raised in 1990’s Los Angeles, the pressures of rising rents and high unemployment began manifesting in Victor’s youth. It was not until 2012, however, that Victor took a more active role in cultivating community when he was assigned to care for the flowerbeds at a local rose garden. He then volunteered as an English Tutor while working odd jobs. This further motivated Victor to realize the value of Community Organizing and its ability to affect equitable change for working class families. Victor’s previous organizing residents around mobility issues and current work as office administrator supports T.R.U.S.T. South LA’s mission to secure community control over land. He began attending T.R.U.S.T South LA’s workshops and campaigns in 2012, and was inspired by the recurring themes of land, shifting power dynamics, and organizing. 2013 was a pivotal year in Victor’s life. With support from friends and family, he was granted DACA status. In 2014, he served briefly on T.R.U.S.T South LA’s Board of Directors as Vice Chair and completed Liberty Hill’s Commission Training Program. I was born and raised in South Los Angeles. Growing up I would hear people around me complain about life in South Central. I noticed the people around me struggling to pay the rent and homelessness has always been around in this area. I used to believe that no one cared and that nothing would change until I went to TRUST and I saw that they do care and that they do want to improve the quality of life for South LA residents. residents deserve to have a housing market where they are included rather than ignored. I want to grow in this organization and help keep homes affordable for South LA residents and I want to help the quality of life improve here. Kevin Mendes is a 25 years-old resident of south central and a member of T.R.U.S.T. South LA. Growing up in South Los Angeles with his mother, brother, and his younger sister, seeing the gentrification and injustices happening in his neighborhood. Kevin has been involved with T.R.U.S.T. South LA volunteering on his free time learned about the current situation his community is in. Working with Public Allies, one of the community organization’s partner organizations, Kevin was able to find out about T.R.U.S.T. South LA projects by attending their events to help people get affordable housing around his community. Motivated and excited to be the voice of the people, joined the organization on September 19th, 2018 in his first year of the Public Allies program, and looking towards the bright future that is to come.